At Liberty Auto Center, we have a long-standing tradition of offering nothing but quality workmanship and exceptional customer service to our clientele. Our owners, Chuck and Troy Parcelles, formed an amazing crew of certified technicians and professional managers to run their full-service auto repair shop. With the right people and the best tools, we offer the most valued, highest quality auto repair in Montgomery Village, MD. When you bring in your vehicle to Liberty Auto Center, you receive a guarantee that we will complete the job on time and in the correct fashion. Maryland requires an inspection of all vehicles for safety and emissions testing before they are allowed on the road. 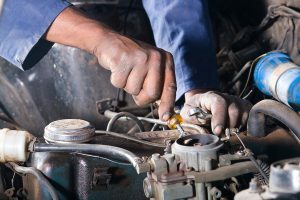 At Liberty Auto Center, not only do we offer auto repair in Montgomery Village, MD, but we also perform full inspections of all makes and models brought into our shop. Our technicians have an eye for quality and can easily spot any inconsistencies or potential problems in our customers’ vehicles. Some of the most common problems found include suspension issues, emissions leaks, or misaligned tires. These will automatically fail a vehicle’s inspection check. Montgomery Village, a planned suburban community in Montgomery County, has a steadily growing population of just over 32,000 residents. Founded in 1962 by Kettler Brothers, Inc, Montgomery Village once featured the Montgomery Village Golf Club, and it now has the Village Shopping Center and bus service to Washington D.C. for tourists and residents visiting the city. For families, the school system is exceptional. The Montgomery County Public Schools system has gone above and beyond for children in the area. For the best auto repair in Montgomery Village, MD, stop into our full-service center. Call usat 240-686-6613 (Flower Hill) or 240-912-5625 (Redland). we would be happy to assist you today.